Are you looking for ways to create balance and establish a peace of mind? I am excited to share with you, this CD by Marlise Karlin. My copy is on it's way so I have not yet been able to actually review this, but just from all the links and you tube clips I can't wait to listen to all of it! I'm sure we can all benefit from The Simplicity of Stillness in our lives. She also has a few teleseminars coming up, so you may want to check those out! Words and music that help you connect to the well of Stillness that lies within us all. In these Stillness Sessions, Marlise Karlin transmits 'The Simplicity of Stillness' through her voice and lyrics. Featuring music from internationally renowned Artists: Matt Emery, Lens Flare, Thom Brennan, Jon Jenkins, Rudy Adrian, Paradiso, Ray. Take a listen in the link below, and you'll see for yourself how relaxing her voice with the music is. Countless people from every culture around the world have attended Marlise’s Programs and are attesting to the extraordinary benefits that her Stillness Sessions® have brought to their lives, from experiencing a sense of peace rarely felt, to finding balance and wellbeing, from releasing years of road blocks, to discovering what they really want out of life and how to create it. Who wouldn’t want that??? Presently, Marlise is offering a 3-Part Teleseminar Course entitled “Opening to Love” – below you will find specific details about her program. In nutshell, participants will learn how to break down barriers and experience infinite love everyday of their lives. 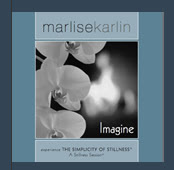 Marlise has also just released her latest Stillness Session on CD called Imagine. The CD retails at $17.95 and is an hour long. Here is a link to her CD, take a listen for yourself!! February 10, 2010 - Phoenix, AZ: Marlise Karlin (www.marlisekarlin.com), a spiritual teacher who offers people a profound connection to their essence through The Simplicity of Stillness™, is offering Opening to Love, a three-part teleseminar course beginning on February 23rd, 2010 at 9:00 p.m. EST, 7:00 p.m. MST, and 6:00 p.m. PST. Each course is 75 minutes in duration. The teleseminar course is open to anyone who would like to open their life to an infinite love that will never leave you. The cost of the 3-Part program is $77 for one registration, $97 for two registrations. The teleseminars will air live, but will also be recorded so participants can download courses and listen at their leisure. For more information on Marlise Karlin and her Practices, please visit http://www.marlisekarlin.com/, check out her Facebook Fan page here and Twitter here. Finding inner peace in chaotic times. How stillness can change your life. Watch a clip here. ONE "Mommy? I'm Hungry!" reader will win a complimentary copy of The Simplicity of Stillness! 1. All you have to do is tell me how you might benefit from The Simplicity of Stillness CD. This Giveaway ends: 11:59 pm pst, Tuesday, February 23, 2010. I wrote this review for "Mommy? I'm Hungry!" about The Simplicity of Stillness. I received free product to keep for this review and giveaway. All opinions for this review are that of myself & family. Some information/images provided by PR and press kit. I think that this kind of program could help me with my anxiety and low self esteem.